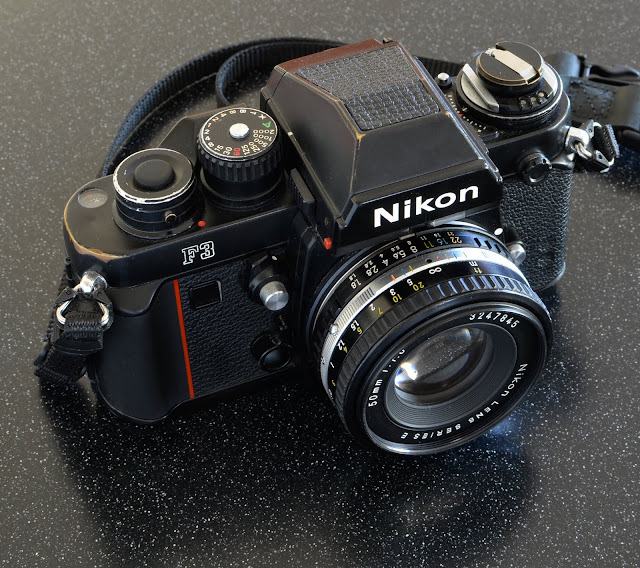 This is my Nikon F3P and the 50mm f1.8 Series E lens that lives on it most of the time. As you can see, this camera is worn. There is brassing on the upper right corner and the rewind knob. 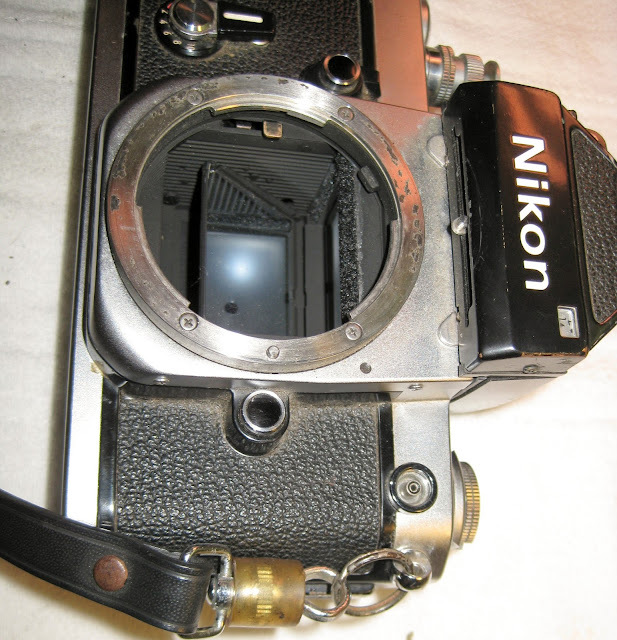 The paint has been worn off the shutter surround, and the top of the finder. It has been used. I think it is beautiful. You might notice that the finder is an ordinary de-2 finder, not the fancy titanium de-5 with the flash shoe that should be there. I bought it that way. It also has the stock back. Doesn't matter, I didn't buy this as a collector's item, I bought it to use, and I do. 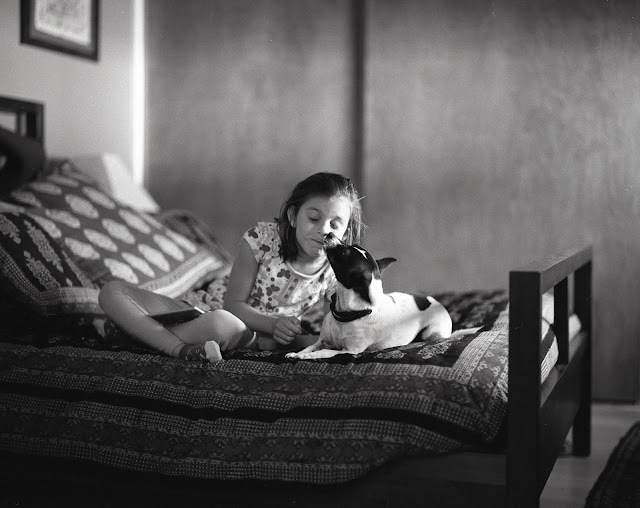 The Series E 50mm is a great little lightweight lens that is just as good optically as my Nikkors. I also have the 28mm 2.8 which is nearly the same size and a 100mm 2.8 which is actually smaller than my Nikkor 50mm f1.4. With one mounted on the body the other two fit comfortably in my messenger bag as a really capable light traveling kit. It will be going with me this week when I fly up to Portland. I'll take other cameras to the airshow, but for my walking around camera I take this. Shot with my brand new toy, the D7000. That is a 16 megapixel DSLR that is one incredible camera. I thought the autofocus on the F100 was fast; this one is instant. Most of my cameras require a half press, full press cycle on the shutter... the half press is to focus, the rest of the press fires the shutter. The D7000 works without the initial half press, it just focuses and fires. Snap, bam, shot taken. I haven't even had time to skim the surface of what this camera can do. Should be fun at the airshow. For this shot, however, I used the self timer, since I don't have a remote. This was shot with the 35mm g f1.8 lens while mounted on my little Manfrotto tripod. Since the Manfrotto is kind of wobbly, the self timer lets the camera settle down before the shutter fires. This was a 10 second exposure at f10 on my kitchen counter using daylight from the right side and a large piece of white construction paper held off to the left to act as a reflector.